Need to mount a graphic on a wall, window or ceiling? This sign hardware is great for showcasing various types of signage with different applications. 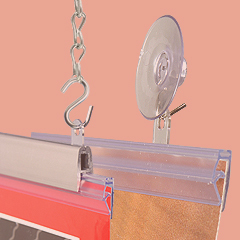 Many options are available, including hanging chain kits, poster rails, and cable displays. Sign standoffs are another great type of sign mounting hardware with their many colorful finishes that accent any installation. 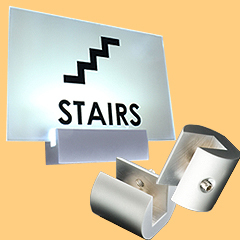 The sign hardware offered here supports signage panels in any material. For example, metal, wood, glass, and acrylic graphics are excellent choices for designers to contemplate. Explore our large collection of mounting supplies styles to meet any corporate, professional, or retail need! What types of mounting fixtures do we offer? 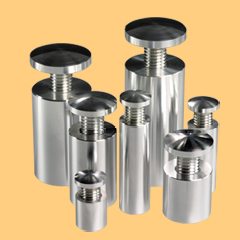 Sign Standoffs: This sign hardware is made of strong aluminum or steel. These are made to insert through panels into the threaded barrel which in turn is wall mounted. There are a number of finishes available including silver, chrome, and gold. Available sizes range from diamaters of 0.5" to 1.5" and the distance from the wall ranging between 0.625" and 2.5". Edge Grip Standoffs: These mount to the wall in the exact same way but, as their name suggests, they hold panels at the edges. In addition to their ability to support a single sign panel, some models feature dual-sided and 4-way designs. 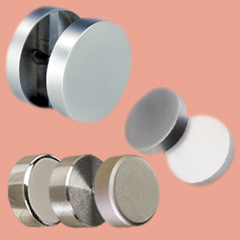 Sizes available range from 0.75" to 1" in diameter with a 0.5" to 8" distance from the wall. Screw Caps and Covers: These are decorative mounting accents that are made to hide unsightly screws. 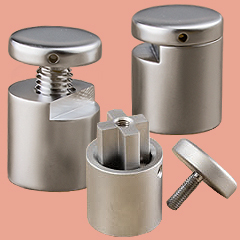 Unlike cheap plastic versions, our line of screw caps is made from metal with chrome, satin silver, and gold finishes. The standard covers come in sets of (8) but we also offer sets with threaded studs for sandwiching panels with a combined thickness of 0.125" to 1.5". This decorative hardware also provides a useful way for attaching faceplates on sign stands, kiosks, plaques, and much more. 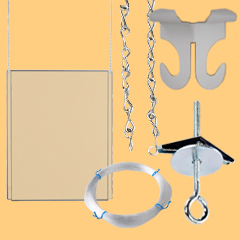 Ceiling Hanging Hardware Kits: These hanging solutions include jack chains or nylon lines in a number of precut lengths. These kits also come with "S" hooks for attaching the lines or chains to sign holders, and a set of ceiling clips and bolts. Poster Rails: These clamp onto graphics on the top and bottom to create a frameless display. Most retailers use these tools for hanging promotional posters from ceilings and walls inside their storefront window displays. Available in lengths from 18" to 72" wide. 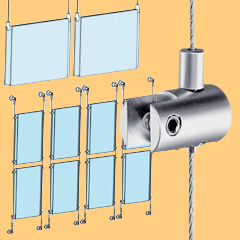 Cable Systems: These suspended displays include steel cables with an acrylic frame that holds signage. The accessories are available in three main styles: ceiling hanging, floor-to-ceiling and wall mounted, making them great for any purpose. In addition, these all-in-one kits come in over a hundred iterations!